Cheap flights from Amsterdam to Zanzibar from €349! Etihad flights from UK to Asia (Bangkok, Singapore, KL) £372 or Australia £559! Cheap flights from many European cities to Bejing, China from €340! Cheap flights from Amsterdam to Zanzibar from €349! Thanks to current TUI fly Netherlands promotion you can book cheap flights Amsterdam to tropical archipelago of Zanzibar. Note that there is additional €15 fee per booking. (No matter how many tickets you purchase). Looking for some escape to beautiful island in Africa and you can easily reach Amsterdam this is perfect solution to visit famous Zanzibar and its world class bone-white sandy beaches. Find below the lowest priced flight deals from Amsterdam to Zanzibar based on the world´s largest charter airlines TUI fly. Note that there is no checked-in luggage included in base fare and you need to purchase separately. (20kg bag available for €20 each way). Take advantage of currently discounted TUI fly Netherlands promotion and book cheap flights Amsterdam to Zanzibar at the beginning of upcoming main tourist season 2018/2019. TUI fly Netherlands promotion offers the cheapest flights from Amsterdam to Zanzibar in November or December 2018. November to March is considered as high season and great time to visit this tropical island in an Indian Ocean. (On the other hand the most famous tourist locations might be a bit crowded). Below you can refer to our booking as well as few travel samples. (Deal is based on direct booking with carrier. You can easily compare there all the cheapest flights Amsterdam-Zanzibar). Zanzibar is a semi-autonomous archipelago off the coast of Tanzania consisting of Zanzibar Island (locally, Unguja), Pemba Island and many smaller islands. 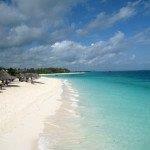 Zanzibar island itself is approximately 90km long and 40km wide. In 1896, Zanzibar was the location of the world’s shortest war, surrendering to Britain after 38 minutes of naval bombardment. If you have booked these cheap flights from Amsterdam to Zanzibar, exotic archipelago in Tanzania, you can read more about this tropical African destination at Wikitravel. See also our previous article about TUI´s discounted deals to the Caribbean here. Althought Zanzibar is a dream exotic destination of many you can still find some affordable accomodation through booking servers such as Booking.com or Hotels.com. Or if you prefer to find your hotel room upon arrival you can still flind plenty of options starting already and $20 for double-room. Best time to visit Zanzibar is considered between June till November. This is still out ouf main tourist season however the weather is dry with cooler temperatures. See also our previous article about TUI´s discounted deals to the Caribbean here. If you have booked these cheap flights from Amsterdam to Zanzibar you can also compare best prices for car rental in this destination via Rentalcars.com. Booking sample of cheap flights from Amsterdam to Zanzibar from €349 return! Your outbound date from The Netherlands to Zanzibar would be on 6th of November. Inbound flight from this tropical island in Africa back to Amsterdam on 14th of November 2018. Take advantage of this latest TUI fly Netherlandss promotion and book cheap flights from Amsterdam to Zanzibar archipelago in Tanzania.